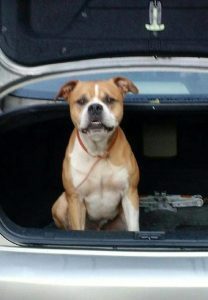 Bullet was born on December 25th 2009, born of purebred an American Bulldog. Adopted as a puppy by his first owner Bullet grew up on the Tickfaw River In South Louisiana. For two and a half years he lived a happy life with his first owner. In the summer of 2012, his owner left for a Memorial Day weekend and never came home, tragically passing away. That day the first owner’s daughter set out to retrieve Bullet from his sitter. He had a tough time adjusting, depression became a concern. Having spent his life free on the river, sleeping snuggled up to his owner, he was now living inside part time, it was a small mobile home community with leash laws. So began his life on a chain, soon after came a dog house. He was loved but life was different & he was sad. Beginning of 2014 he and his family relocated to a private lot, with a huge tree & tire swing. Life was better Bullet was happier. He loves those tire swings. That December his owners had their first daughter. Bullet was protective of the new baby. With new babies come new house rules & sometimes allergies so Bullet became a full-time outside doggie only coming inside to visit. He had to adjust again, I’m sure feeling replaced as the baby of the family. Every opportunity he would run off for hours on end. In 2015 his owners were displaced and had to relocate to an apartment complex, I really wasn’t looking to get a new pet, as just a year earlier we lost a 7 month old puppy my husband rescued from neglect, but he was to late. It was an unexpected situation, but we had tons of love to offer Bullet! We moved that year, to a home on an acre of land, with a huge family area outback. Still living under strict leash laws, but if we were outside he was off his lead. He thrived he was at his happiest. Then one night I went inside for just a moment, came back out Bullet was gone. He never ran off anymore so someone had taken him. All anyone had to do really was offer him a ride. He’s never been aggressive, always friendly. He was gone 11 days! We sent out missing flyers, even a reward. Finally a friend saw him right around the corner from home, with two smaller labs. She alerted me straight away. He was finally home but boy was he in bad shape! He had lost 1/3 of his body weight & hurt everywhere! We took him to the vet ,they told us it looked as if Bullet had been backed into a corner and beat with a stick, there was evidence of another dog attacking him & an injury that could only have occurred by someone kicking him in his bottom. He had survived & he was home. He began having separation anxiety & flinching with sudden movement. He got better but the situation changed him emotionally. Then last year we had to be in PA for 2 & 1/2 months. He had a wonderful sitter but he missed us & we missed him. We rushed home after getting a phone call from home that Bullet ran away & may have been shot. Fragments were removed from his shoulder, and he healed. May 2018 due to a family & health dynamics we moved to PA. It was an unexpected relocation. Doggie heaven for Bullet though! We live on 26 acres of land on a dead end road! He’s been happily chasing turkeys & geese. Barking at deer letting them know he’s King Of The Hill! It’s my regret that me being uneducated about heart worm disease Bullet now is heartworm positive. Thankfully they haven’t attacked his heart yet. Any donation toward his treatment would be greatly appreciated. It’s my desire that Bullet live to enjoy his new life to the fullest. Thank you in advance!